Thought I would start up a Vistaprint Frequently Asked Question section. This also has a lot of my tips and trick to getting around VP if you plan to use their software to design you own creations. Please feel free to comment below with any questions and I will try to respond asap. UPDATE: Vistaprint seems to slowly be taking away all the deals that made using them such a deal for people on a budget. First they took away the 10 free items and made it 2 free items. They stopped the $70 groupons and have been releasing $45 ones. (and even those are hard to find – no more daily groupons available) When you get to your cart there is now a “promo code” box. The site Never had that before. We have yet to test a groupon and retailmenot.com sale double up. They might finally be closing all of our loop holes. Sorry to say, it might be the end of the Vistaprint Hauls. On 1/9 it was observed that the Retailmenot 50% link has expired. Q: CAN I DOUBLE UP MY LIVING SOCIAL DEAL WITH ANOTHER COUPON CODE/LINK? Q: I’M FROM CANADA, CAN I BUY A USA GROUPON? A: Yes. There have been a few Canadians that have told me they have done it. Here some discussions where it is talked about. Patty R – read what she did. Q: HOW MANY GROUPONS WILL I NEED FOR MY ORDER? A: I suggest you click on your sale link that you plan to double up with to figure out the math. HOWEVER, when you check out, you will need to click Groupon FIRST and THEN the Retailmenot50% link. Q: HOW DO YOU KNOW HOW MANY GROUPONS I’LL NEED? A: A groupon costs you $17 to buy the $70 one and $25 to get the free shipping. Each order should charge your credit card a total of $42. Once your credit card is being charged more than $65 for the first order, you might as well get a 2nd groupon and split your items into 2 orders. You will be spending about the same amount of money, but will get twice as much stuff. $25 for the 1st order and $42 for the 2nd order . Q: CAN I USE MORE THAN 1 GROUPON PER ORDER? Q: WILL VISTAPRINT INVITES FIT POCKETFOLDS? A: Only 2 sites sells pocketfolds that will fit with out trimming down the invite. 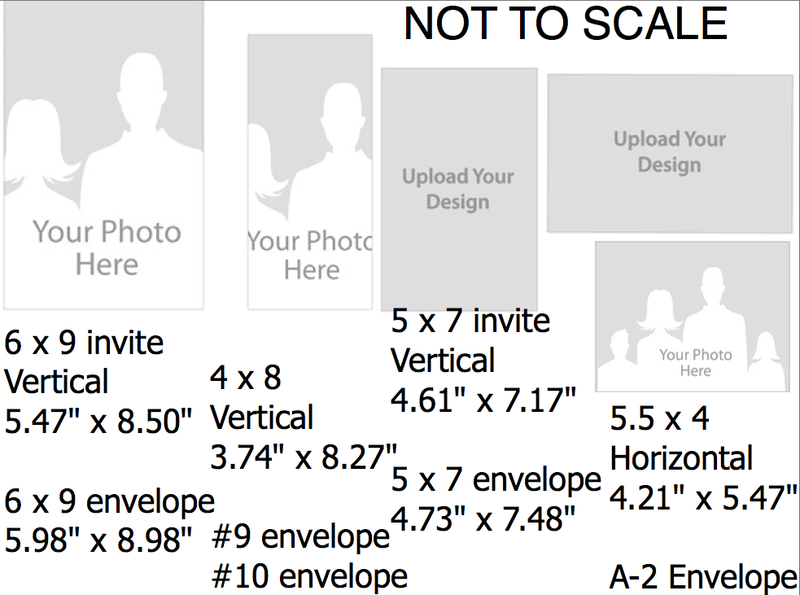 * Vistaprint 5″ x 7″ Invites are not really 5×7 and are too big for 5×7 pocketfolds and too big to fit many Etsy invites that you may find to download. A little of the design on the right and left sides will be lost if you stretch the design to reach the top and bottom – OR – you will have some white empty space on the top and bottom if you don’t stretch the image. More details HERE on how to do 5×7 pocketfolds with vistaprint. Q: DOES VISTAPRINT SELL POCKETFOLDS? A: No, they do not. The invites and notecards come with free Thin white envelopes. If it is in the budget I suggest you get the matching envelopes when you are doing your check out for the invites. My opinion is that the thin white ones are ok for rsvp’s. If it is in the budget and you can get the nicer envelopes for the rsvp’s, go for it. Q: HOW DO I USE MY ETSY DESIGN WITH VISTAPRINT? 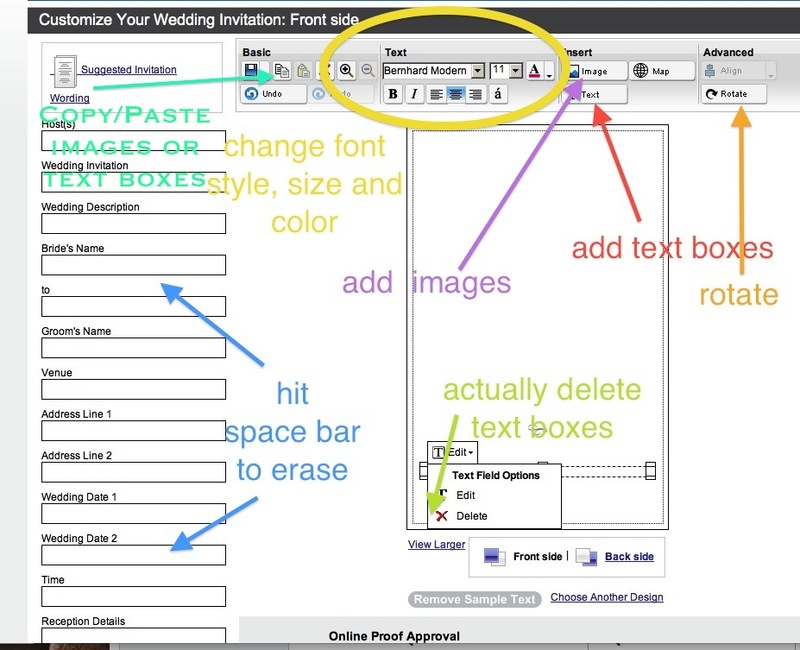 A: If you wish to use the Vistaprint invite in the size it is (and not trim any of it off) you would need to contact the seller and see if they can change the dimensions on the invite before they send you the file. Q: I HAVE MY DESIGN, ANYTHING SPECIAL I NEED TO KNOW BEFORE I UPLOAD IT? Q: AND WHERE DO I FIND THE DIMENSIONS OF THE VISTAPRINT INVITES? You will now see all the invites available with the ACTUAL sizes in the parentheses. There is also a tab at the bottom that you can click to get more detail on the dimensions, the suggested upload dimensions, and descriptions of the different types of paper weights available. It is also difficult to tell the size of the designs when you are looking at them all at once. 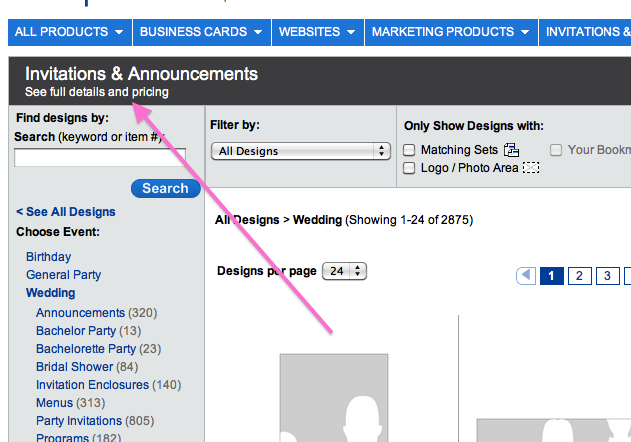 I usually like to click the “view all designs” and then use the drop down to select the size invite I wish to find. Q: I LOVE A DESIGN. HOW CAN I FIND OTHER DOCUMENTS TO MATCH? 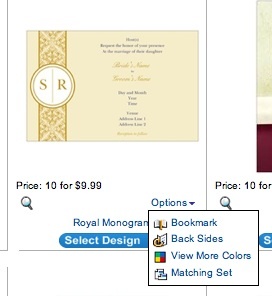 A: OPTION #1: You can use the drop down menu on the design, Matching Sets. Option #3: You can search the Vistaprint image library and build your design over an existing design to try to create a matching set. 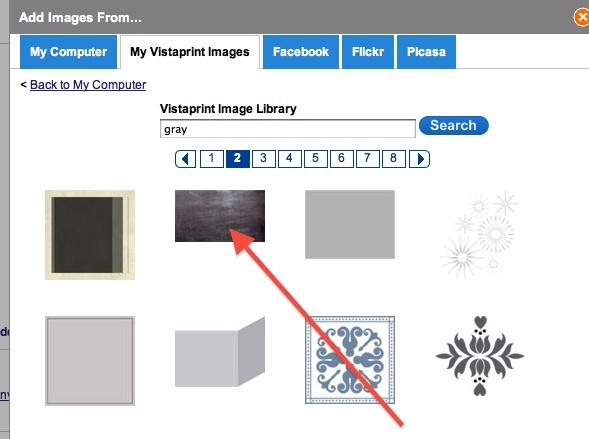 Once you are in the advanced edit screen, you can select “Insert Image” and search the VP image library. I personally use “white” as a search word a lot for when I want to cover an existing design image. Option #4: You can add any document that you wish to create to your cart. 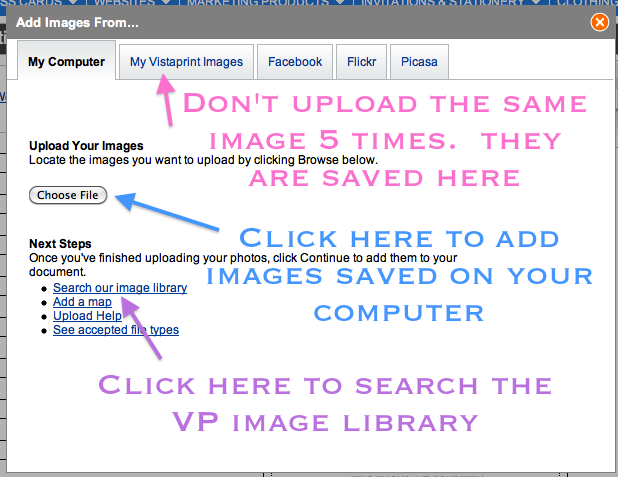 Then get on the VP chat and ask a representative to move an image from one document to another. Have your portfolio open so you can tell them the ID# of the item you are trying to match. VP chat can be found under “Help.” Under the FAQ section is a “Contact a Customer Service Representative” link. Q: I WANT TO SEARCH THE VP IMAGE LIBRARY AND ADD A DESIGN OVER AN EXISTING VP DOCUMENT, HOW DO I DO THAT? Then you can crop and stretch your images as needed. A: You can stretch the image once you get to the advanced edit screen. After you upload the image to the invite it asks you to click “next.” Click on it to get yourself to the advanced edit screen. Once you are on the advanced edit screen you will need to right click on the image so that you can get the drop down menu. 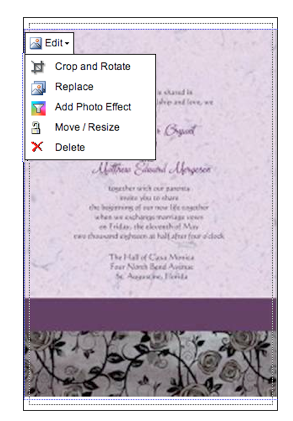 Select “move/resize” and you should be able to move and stretch your image to reach all 4 sides of the invite. If your design was not created and saved in the correct dimensions, you are going to lose some of your design. Notice how some of the design below will move off the sides document if the design is stretched to print all the way to the top and bottom. *again, if you plan to use pocket folds, just leave the white space and use a paper cutter (or go to Kinkos/someplace) and get the invites cut down. Q: I FOUND A DESIGN IN THE INVITES SECTION THAT I WISH TO HAVE RECREATED ON THE POSTCARDS (to save money.) HOW DO I GET THE IMAGE ONTO THE POSTCARDS? 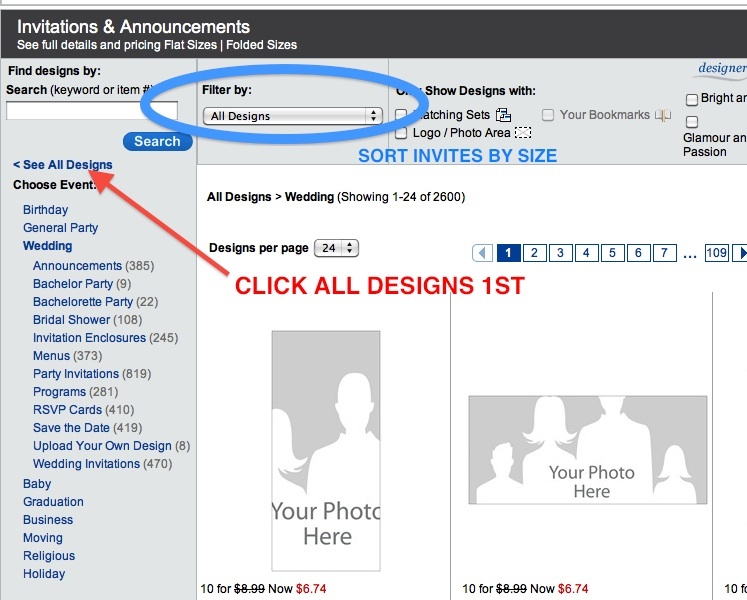 A: You get on the VP chat or phone a representative to move the design for you if you can not find the image yourself when you search the VP Image Library. Q: WHAT’S THE DIFFERENCE BETWEEN CMYK AND RGB? AND WHY SHOULD I KNOW THIS? A: I’m going to pull this answer right from VP. http://www.vistaprint.com/customer-care/service-center-faqs.aspx?faq_id=113 VP uses CMYK printers. If you want your final document to look as close to the colors represented on your monitor, use CMYK when creating your designs. This is really only important to those that are designing their own creations and uploading. Q: I NEED 150 ITEMS AND THE QUANTITY JUMPS FROM 50, 100 TO 250 (or some other number combination.) CAN I DO IT? A: You can put in an order of 100 AND an order of 50 (or whatever number combination VP allows to get you as close to the needed amount. To do this you need to make a “COPY” of your document. Go to “My account” in the top right hand side. Click “View Whole Portfolio”. Find your document and you will see the link to “Make a Copy.” Give the copy a name. Then add it to your cart. You can order 100 of the “Original” design and 50 of the “Copy” design to get your quantity of 150. Q: I’M ADDING AN IMAGE TO CREATE MY OWN DESIGN, AND THEY ARE NOT STACKED IN TEH RIGHT ORDER. HOW DO I GET AN IMAGE BEHIND ANOTHER – Or – HOW DO I GET A TEXT BOX OVER AN IMAGE? Q: WHERE CAN I FIND THAT FROSTED IMAGE TO PUT OVER MY IMAGES TO CHANGE THE OPACITY? A. You will need to search the VP image library. Search for the word “White”. Flip through the pages until you find an image with a small faint ribbon image. You will need to crop the ribbon out. 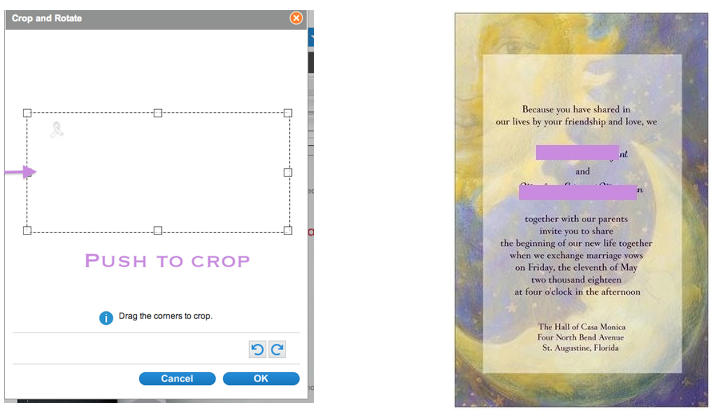 You might need to change the size of your cropping a few times until you get the right size. Q: I HAVE SELECTED A TEXT BOX BUT IT WON’T LET ME EDIT IT. I CAN’T CHANGE THE FONT TYPE, THE SIZE, OR COLOR. HELP! A: Sometime VP just has a glitch. Click on the “SAVE” link (blue floppy disk image) next to “copy” to save your work. See if that fixes the problem. If not, try to refresh* your page. *be sure to save your work first. Posted on July 17, 2013, in Making Items on VP, Tips to Navigating Vistaprint, Vistaprint ~ Tips and Tricks and tagged bring forward, FAQ, help, How do I, how many groupons do I need, no more always free items, no more free items, Order in smaller quantities, question, send back, size of vistaprint invites, split an order, template, two groupons, upload own design, use 2 groupons, Vistaprint, what happened to the 50% off, what happened to the free items. Bookmark the permalink. 3 Comments. Thanks Hayley! You truly are the queen of all things Vista Print. Are you going to start a forum? We are in desperate need of a forum. I would be happy to help. Just wanted to update that a lot of the free item links are gone – I haven’t tried them all but the mugs and totes are no longer available.